Playing catch up is never fun, and we’re behind on two Show Notes posts! Firstly, A Good Habit from September 24, where we talked about that day’s feast of Our Lady of Walsingham. This feast is probably not widely known in the states, but it’s central to the Marian devotion of the Catholic Church in England. In fact, as we mentioned on the show, England has long referred to itself as the dowry of Mary, meaning that England saw itself as being under the protection and sheltering love of Our Lady in a unique way. Though the exact origins of the term are unknown, it arose in the medieval period, when Marian devotion in England was very strong. Fr. Mark Elvins, OFM Cap, believes the term arose, not from popular devotion, but from the solemn consecration of England to Our Lady by Edward II in 1381. If you’d like to read more about that very interesting topic click here. 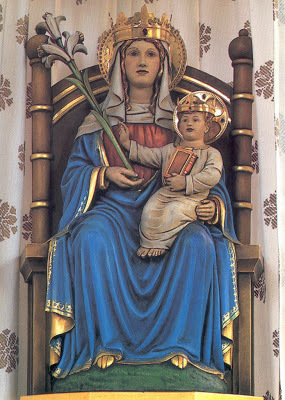 But back to the feast of Our Lady of Walsingham (as you can see, we get sidetracked on the blog just like we do on the radio). Since you’re getting such a good history lesson today, don’t stop now. Click here to learn about the origins and modern revival of the shrine of Our Lady of Walsingham. For an explanation of the statue click here. 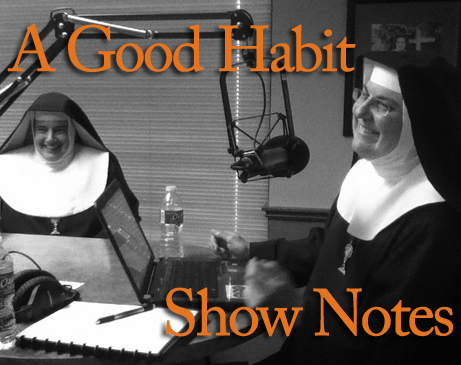 Now onto last week’s show from October 1st. Please keep Doug Pearson, Director of Radio Operations for GRN, in your prayers as he battles stage four cancer. His blog is a witness to our Christian hope, and we encourage you to check it out, and accompany him as he carries this cross in union with Jesus. Mario recommended a great video by Taylor Marshall about St. Michael and Lucifer. Since we just celebrated the feast of the archangels last week, this would be a great way to feed your faith and honor the angels. You can find that video here. One of our callers, Theresa from Pennsylvania, told us that her father had a great devotion to the poor souls in purgatory, and would often pray the Prayer of St. Gertrude, which Our Lord promised St. Gertrude would release a thousand souls from Purgatory each time it is said. Theresa’s dad would send the prayer to his 12 children every year – just think of how many poor souls were released from purgatory because of those prayers offered up over the years. The poor souls can’t pray for themselves, they depend on us to assist them with our prayers and Masses. And once they are released from their purification they won’t forget us, and will certainly intercede for us from heaven. Intercede for a poor soul and you’ll have a friend for eternity! So let us be devoted and grateful to such great protectors; let us return their love and honour them as much as we can and should. Yet all our love and honor must go to him, for it is from him that they receive all that makes them worthy of our love and respect. This entry was posted in A Good Habit and tagged Doug Pearson, Feast of the Archangels, guardian angels, Office of Readings, Our Lady of Walsingham, Poor Souls in Purgatory, Prayer of St. Gertrude, St. Michael, Taylor Marshall by texasnuns. Bookmark the permalink.